Hi, is there a way, similar to TextMate, where if I select some text I can then wrap it in quotes or some other tag on either side of the selected string? I did... nothing happens, what do I do after that? Or what is the procedure for using it properly? "nothing happens"? you don't get this popup? Not in .css files to be more precise... I did test it in php files and i saw the popup. Preferences> Editor > General > Smart Keys: Surround selection on typing quote or brace. For google's search sake. <- how do you think we got here? @Jasson works with quotes and brackets, but cannot wrap with tags. Screenshot from Alexey Gopachenko's post shows what can be used for tags. It even has Emmet there (e.g. 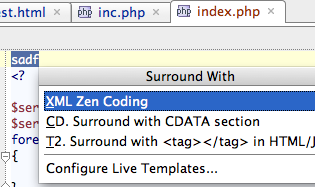 so you can surround multiple lines into <li> tag each). Quote (double or single), braces -- they are all single symbols. But tag requires at least 3 symbols to type so such "surround" that Jasson have mentioned cannot be applied here. I want to wrap them with something like System.out.println(" ");. I can do this by vertical typing but would be quicker if I had a template for that. You may use Multiple Carets for this. Not the same, but does the job in most cases. Thanks @Andriy that looks like a useful one!